Full Architectural Service to provide a bespoke head office, warehouse and distribution facility for Extertis in Padiham, Burnley. 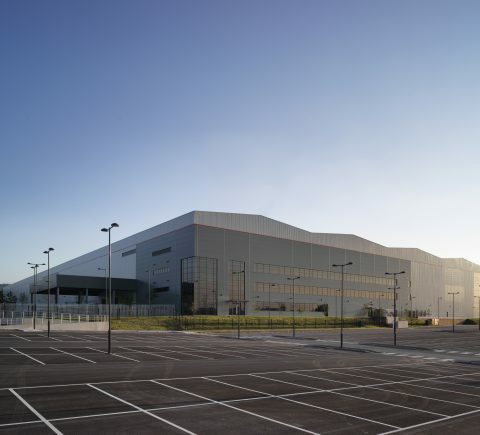 Exertis Gem Distribution commissioned the development of a bespoke large industrial unit with integral offices and mezzanine spaces to act as the head office and main distribution point for a fast growing business. The project included the design and development of a 543,620sq.ft. warehouse, incorporating 3 floors of offices, 2 floors of mezzanines and a fully functioning warehouse / drivers office located centrally along the front elevation of the yard area. The site also includes future expansion space and takes a large portion of the remaining business park, equating to just under 32 acres of the overall 70 acre site. Please see below timelapse video showing the 56 week build undertaken by Bowmer & Kirkland on behalf of Eshton.